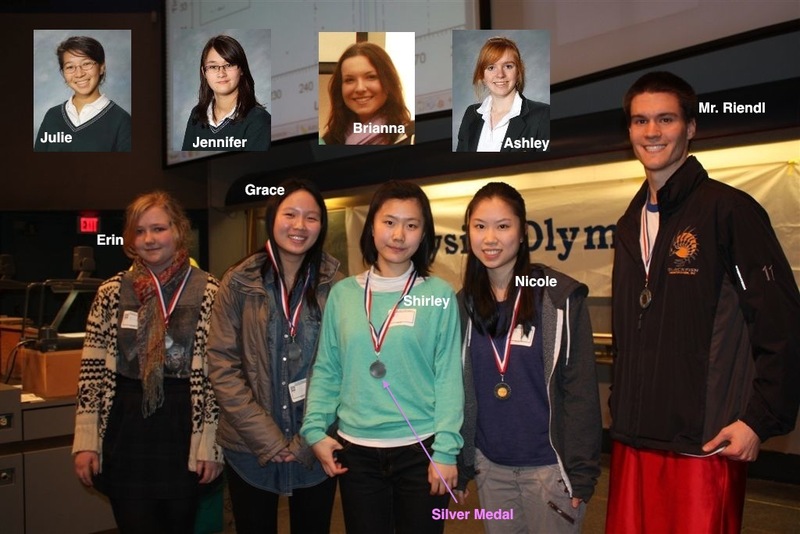 On March 12th, eight students from Grades 11 and 12 took part in the annual UBC Physics Olympics. 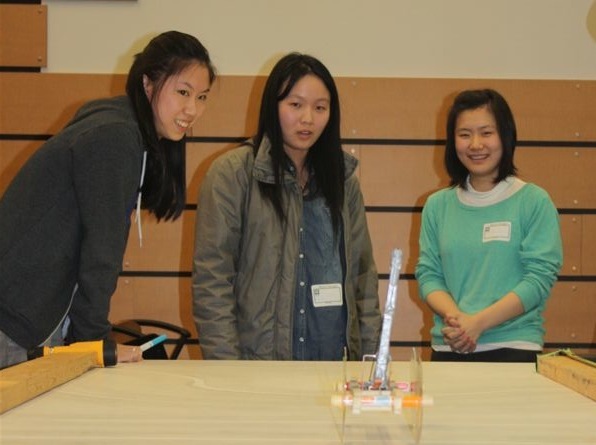 Shirley, Brianna, Grace, Nicole, Julie, Jennifer, Ashley and Erin took part in six events designed to test their ability in engineering and various aspects of physics. We competed against 56 teams from schools from British Columbia and Alberta. We could only prepare for two of the six challenges, which both involved constructing devices designed for movement. Working as a team, we got together and created a mousetrap car and a golf ball driver. Overall, we did very well in our events, and left with a silver medal in the mystery event. Nice! The daylong competition provided a great opportunity to put our physics knowledge to practical use and to test ourselves against students from other schools. It was a good learning experience to be able to see what students from around Western Canada could do in the realm of science. Along with exercising their brains we spent time chilling out, playing cards, eating a variety of ethnic foods and cruising around the UBC campus on their complimentary segways. 🙂 All in all, ‘twas a magnificent day in the world of science, and it will forever remain dear to our hearts. All in all, it was a great experience and we can’t wait to do even better next year! I just read about your team’s efforts at the Physics Olympiad and was impressed! We would like to invite any grade 8-12 female students to to attend our Westcoast Women in Engineering, Science & Technology Luncheon (WWEST) where they will be given the opportunity to meet like-minded prospective students, current students and alumna. You will be welcomed by Dr. Elizabeth Croft, the NSERC Chair for Women in Science and Engineering and Professor of Mechanical Engineering, and then while enjoying a delicious lunch, you can listen to current UBC Engineering female students and UBC Engineering Alumna who will share their experiences and ideas about the extensive options within engineering and why engineering could be a great career choice for you. Please RSVP here for the WWEST Luncheon: http://bit.ly/v1Dhhu. You are welcome to join us earlier in the day by attending our UBC Engineering Open House Fair (9am – 4pm) to explore all your options at UBC Engineering. You can find more information here http://www.engineering.ubc.ca/connects. Our focus at UBC Engineering is to make a difference – we hope you will part of the change to help achieve our goal.